Through this kind of actvities, what it is aiming to achive is an improvement of employee productivity, at the same time they make team work easier between coworkers, and as a consequence it makes also an improvement of interpersonal relations, stressless at work and motivation growths. 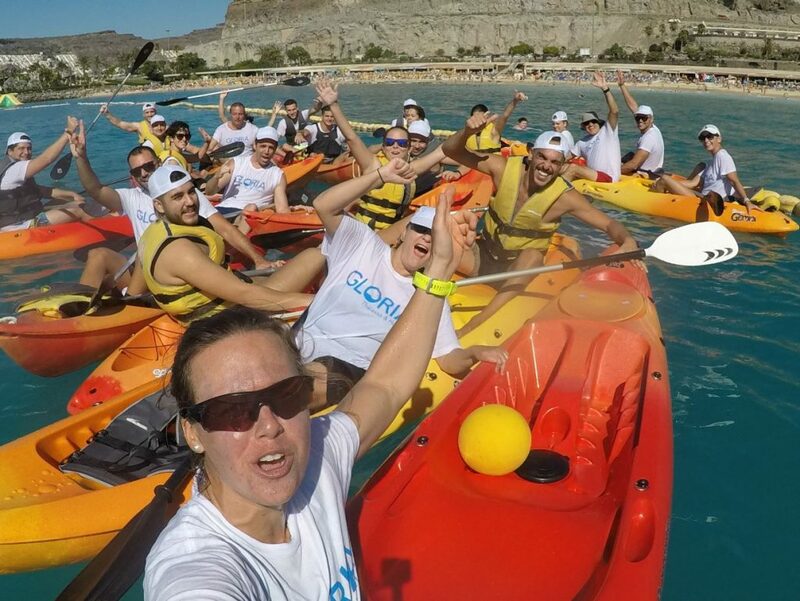 This year, Tara Pacheco, sailing olimpic racer and one of the best and outstanding canarian athlete, participated in a Kayak journey and the team. All participants were very proactive as well as they showed their courage and team spirit through a race circuit from Puerto Rico Beach until Amadores Beach. Smiles and good moments were not bypassed. At the end, in the middle of the sea, Tara gave a motivational speech to every employee. That was such a prominent moment because of her emotional speech which people realised the importance of team work to get their common goals.